The Castle of Esslemont can clearly be seen from the A920 west of Ellon in Aberdeenshire as it is adjacent to the road. The castle is built towards the summit of a low hill overlooking the Ythan river valley to the north, and to the west the hill slopes down to the Bronie Burn. Although the site has good views across the valley, it does not appear to have wider significance, and the steeper sides of the slopes close to the Ythan make the river itself invisible from Esslemont. The castle is surrounded by a ditch which forms four sides of an irregular pentagon, the fifth side being occupied by the main road, within which are the remains of a walled courtyard with round towers at the northern and western corners. A bulge at the north-eastern corner is suggestive of a third tower, but changes to the structure to the south and east mean that the original pattern of this feature cannot be followed. In the centre of the courtyard are the remains of an L-shaped tower with three vaulted basement rooms, along with a narrow entrance lobby in the re-entrant angle. The remains of a rectangular room of slighter construction can be seen to the south. The L-shapd tower is believed to be of 15th century date, with walls 2m thick, and the rectangular building to the south of 18th century date, walls only being 0.6m thick. To the north-east of this tower is the most impressive standing remains at the Castle of Esslemont. This is a second L-shaped tower house, with a round tower at the external angle, and an extension to the north-west which reaches the area of the demolished round tower by the ditch. This tower has walls which are only 1m thick, and the basement rooms were not vaulted, which suggests a later date than the late 16th century suggested by Canmore. Above this were two further floors, which were reached by a stair turret in the re-entrant angle. The building is rather plain in its current form, and may have been remodelled in the 18th century, when the extension was added to the north-west and the extension to the old tower was erected. Opinions are divided as to whether the old tower remained in use at this late date, but it seems unlikely to me. Esslemont lies to the south of the Ythan, and therefore lay within the area known as Formartine. This was an area which had historically been held by a large number of individual lords, most of whom will have had close ties with the Comyn family, earls of Buchan. Esslemont itself was held by the Marshall family, who received a charter of the lands from Robert Bruce, and then passed with marriage in the 14th century to the Cheynes, lords of Inverugie near Peterhead. Towards the end of the 14th century, the Marshall heiress married Sir Reginald Cheyne of Straloch. The Cheynes were most likely the builders of the old tower of Esslemont, and towards the end of the 15th century became involved in a feud with the Hay family. During this feud, the “place of Esslemont” was destroyed, and shortly after the feud was put to an end by the marriage of John Cheyne of Esslemont to Margaret Hay of Ardendraght, a license was granted to John Cheyne to build “upon Esslemont a tower or fortalice where he thinks most expedient.” It seems certain this fortalice was the old L-shaped tower in the centre of the site today, probably replacing an earlier manor which may have been surrounded by the ditch. At an unknown date the wall around the ditch and the towers were added, permitting the castle to be defended by artillery. By the mid 16th century the Cheynes had become followers of the Hays of Erroll, and supporters of Queen Mary, and maintained a Catholic faith during the Reformation period. The last of the Cheynes of Esslemont, John, found himself in dire financial trouble, and sold Esslemont to the Keith laird of Ludquharn before 1607. By 1628 it was held by the Forbes laird of Pitsligo, and in 1653 it was in the hands of the Jameson family of Aberdeen. Some of the lands of the barony of Esslemont had been acquired by the earls of Erroll, who were in possession of the castle by the end of the 17th century. It is not known which family built the new tower house, which has no distinctive features at all to help identify the family or the date of build, but since tower houses fell out of fashion after the Civil War period it is less likely to have been the Jamesons or Hays. Sometime early in the 18th century the whole of the lands and barony – including the castle – were sold to James Gordon of Ellon, who in 1727 he sold Esslemont to Robert Gordon of Hallhead. This family of Gordons were most likely responsible for the extensions to the new tower house and the old tower, including the partial filling in of the ditches to permit these extensions. 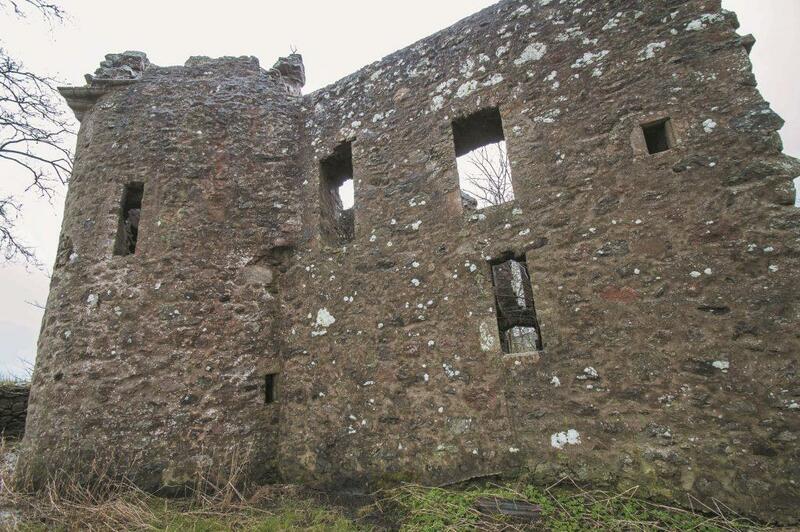 The castle was abandoned in 1769 in favour of Esslemont House, and left to decay.